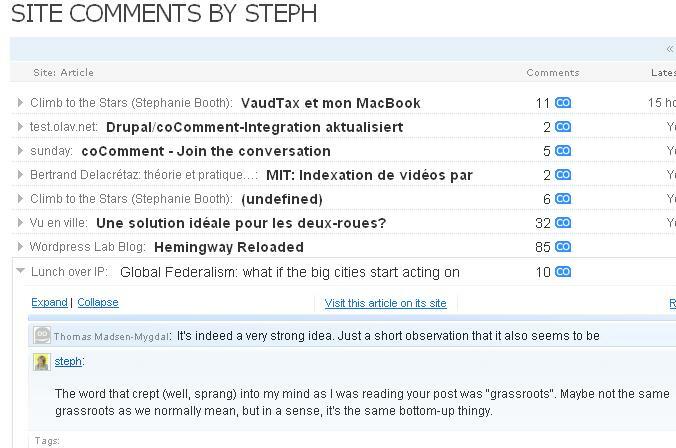 If you're a power commenter, you probably have comments scattered over blogs all over place. It's a hassle to keep track of replies especially when they come hours after your original comment, and you've moved on to something else. It's probably one of the more annoying things to feel compelled to check on every post you've commented on to see if anyone's responded to you. coComment is a partial solution to this problem, allowing you to track your conversations in one place. 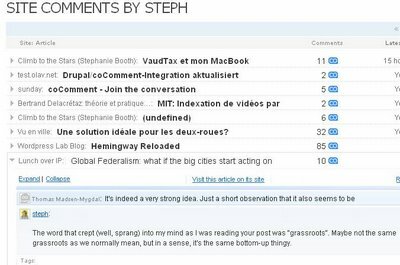 You integrate coComment into your browser either through a bookmarklet or a Firefox extension, and it records comments you make on most blogs out there. In the case of Blogger, the pop-up comment form doesn't get saved. If a new comment is posted, coComment notifies you. coComment also allows you to put a tag cloud on your blog although I got a 404 error when I tried to get to the page to test it out. An interesting feature coComment has is a sort of meta-feature that allows you to comment on sites without comment functionality like nytimes.com or google.com. That's probably the most innovative feature they have and may potentially allow them to become the leading universal commenting service. You can also see what top bloggers like Scoble and Pete Cashmere are commenting on. Hi! glad you liked our service. Would you mind giving me the URL of the page that returned the 404? Thanks in advance!